If you become a patron of mine you will be helping me to work towards my ultimate goal of being a parent who works from home and being able to create as a source of income. Patreon will allow me to ensure that I have a steady flow of art supplies which will allow me to create art that will be shown and sold. What will this Patron Support? Thank you! This tier will allow me to purchase an eraser to adjust those happy little accidents that pop up now and again. This is also the equivalent of purchasing 2 sheets of bristol board or paying for 40 minutes of parking downtown so that I can work at the local tea shop. This tier allows me to purchase new ink to make sure my comics look super professional. It will also allow me to make sure I have the latest versions of any software that I am using. Updates at least twice a month. A shoutout on social media. 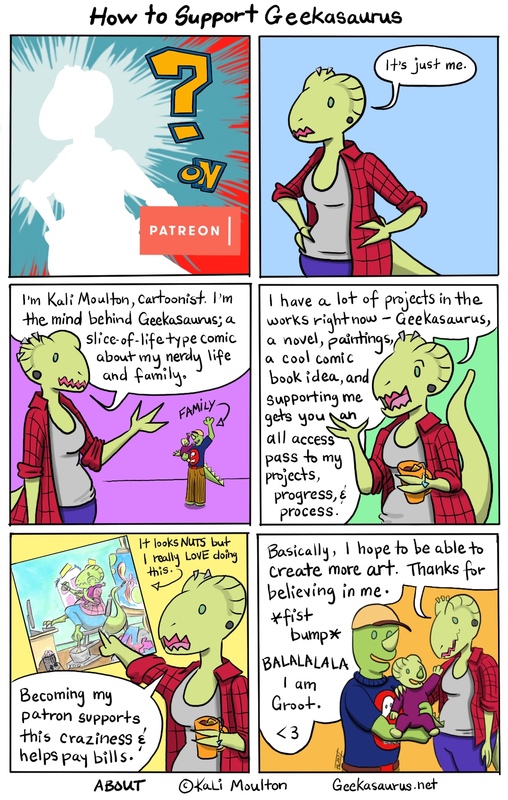 Access to any bonus content I may create including extra Patreon-only comics, behind the scenes of Geekasaurus or other previews of my creative work. Also invites to any public events I am at! You might get a cool thing in the mail every once in a while. This tier will just about cover one month's worth of web hosting for my websites and keep my software up to date. Access to any bonus content I may create including behind the scenes of Geekasaurus or other previews of my creative work. Also invites to any public events I am at! 10% off purchases on my website or in person and Patreon Exclusive Sales. You might even get a cool thing in the mail once in a while. When I reach $50 per month, I will be able to begin buying the equipment that I need to start taking good time-lapse videos of me creating comics and art. Or, I could pay for one high-quality scan of a small painting each month, enabling me to offer archival prints of my new works.